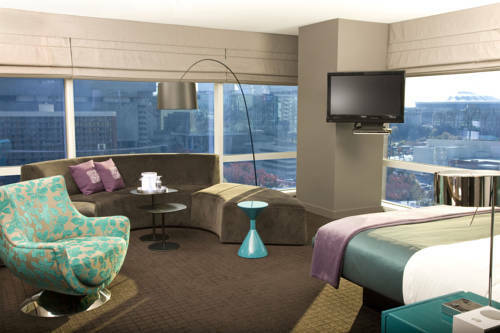 In Atlanta's exciting downtown, the W is a lush hideaway infused with natural elements and sensual style, where revitalization and rejuvenation beckon amid major corporations, specialty shopping, upscale living and everything cool about Hotlanta. Going south is now in season all year round. Cozy up in our Living Room or succumb to indulgences at W Kitchen. Whisk away from our private heliport or wind down at luxurious Bliss Spa. Workout at FIT. Come play in style. Southern charm meets modern living is everything you've dreamed of-the signature W bed, High Speed Internet Access, lovely Bliss amenities, fabulous entertainment, delightful W MixBar and Whatever/Whenever service that makes wishes come true. DRINKSHOP: Savor W Kitchen's innovative American cuisine-scratch made from local and seasonal ingredients. Living Room: The Living Room is a great place to relax and enjoy a meal right at the convenience of your hotel. WETBAR: Wet Bar - Open Seasonally. Apartment Realty Advisors Of Georgia Inc.
Marsh and McLennan Companies, Inc.